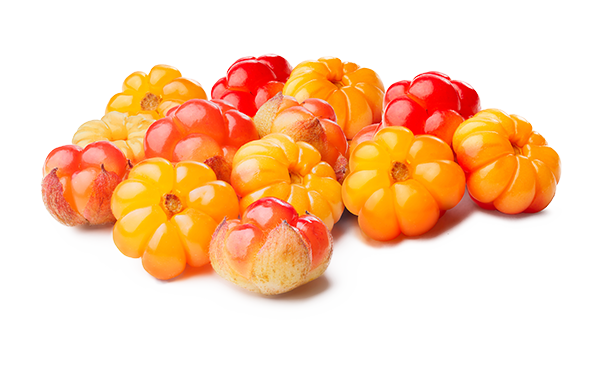 Steeped in folklore, cloudberries are the most exclusive of Swedish berries. They are also superberries and are packed full of vitamin C, which we need for our body’s support and structure. Cloudberries are highly sensitive to weather conditions, grow sparsely in boggy areas and need plenty of sunshine. As such, they grow best in the north of Sweden where the summer days are long and light. Picked individually by hand, they shimmer with luxury and are not overly sweet, just wonderfully tasty. Rich in fibre, omega-3, iron and calcium, cloudberries bring with them the power of the plant kingdom. They are also high in vitamin C, which helps the body to absorb iron from food and contributes to the formation of cartilage and bone tissue. Cloudberries contain three times as much vitamin C as oranges and are truly a Swedish superberry.